Discoveries of the molecular basis of epidermolysis bullosa have resulted in the development of diagnostic tools, including prenatal and preimplantation testing. Based on a better understanding of the basement membrane zone (BMZ) and the genes responsible for its components, newer treatments (eg, gene or protein therapy) may provide solutions to the skin fragility found in patients with epidermolysis bullosa. Related articles include Epidermolysis Bullosa Acquisita and Pediatric Epidermolysis Bullosa. Dominantly inherited dystrophic epidermolysis bullosa. The blistering in this disease often is localized and is characterized by scarring and milia in healed blister sites. Dominantly inherited dystrophic epidermolysis bullosa. 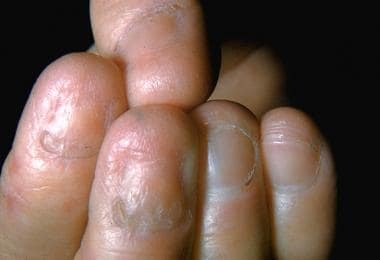 This subtype, similar to other dystrophic and junctional epidermolysis bullosa subtypes, can result in nail dystrophy and loss. Many stratified squamous epithelial tissues, such as the skin and oral mucosa, contain a complex basement membrane zone (BMZ). The BMZ is composed of many specialized components that combine to form anchoring complexes. At the superior aspect of the BMZ, keratin-containing intermediate filaments of the basal cell cytoskeleton insert on basal cell plasma membrane condensations termed hemidesmosomes. Anchoring filaments extend from the basal cell plasma membrane into the extracellular environment and span the lamina lucida, connecting hemidesmosomes with the lamina densa. At the most inferior aspect of the BMZ, type VII collagen‒containing anchoring fibrils extend from the lamina densa into the papillary dermis, connecting the lamina densa to anchoring plaques, trapping interstitial collagen fibrils. Thus, the cutaneous BMZ connects the extensive basal cell cytoskeletal network with the abundant network of interstitial collagen fibrils in the dermis. Keratins 5 and 14 combine to form intermediate filaments in basal keratinocytes. Keratins contain a central alpha-helical rod with several nonhelical interruptions, as well as nonhelical carboxyterminal and aminoterminal regions. The regions of highest conservation between the keratins are located on the ends of the keratin rod in the helix boundary motifs. Keratin intermediate filaments insert upon electron-dense structures termed hemidesmosomes. These structures contain intracellular proteins, including plectin and BP230. Plectin (HD1) is a 500-kd protein that binds intermediate filaments. BP230, also termed BPAG1, is a 230-kd protein that has homology to both desmoplakin and plectin. BP230, like plectin, functions in the connection between hemidesmosomes and intermediate filaments. Hemidesmosomes also contain the intracellular portions of the transmembrane proteins collagen XVII (BP180) and alpha-6-beta-4 integrin. The beta-4 integrin subunit performs a central role in hemidesmosome formation and contains an especially large cytoplasmic domain, which interacts with other proteins of the hemidesmosomal plaque. Collagen XVII is a transmembrane collagenous protein that interacts with alpha-4 integrin and BP230 intracellularly and with laminin-332 extracellularly. These structures contain the extracellular portions of collagen XVII (BP180) and alpha-6-beta-4 integrin. In addition, anchoring filaments contain the molecules laminin-332 and laminin-6. Similar to all members of the family of laminin proteins, laminin-332 is a large heterotrimeric molecule containing alpha-3, beta-3, and gamma-2 chains. Laminin-332 forms a disulfide-bonded attachment to laminin-311, the other known anchoring filament laminin, which contains alpha-3, beta-1, and gamma-1 chains. Laminin-332 also forms a strong association with type VII collagen, which serves to connect anchoring filaments with anchoring fibrils. Type VII collagen is the primary component of anchoring fibrils. Type VII collagen contains a large N-terminal globular domain (NC-1), which interacts with laminin-332 in the lamina densa; a long collagenous domain; and a smaller C-terminal globular domain (NC-2), which is cleaved proteolytically during anchoring fibril formation. Type VII collagen chains form a triple helix; then, two molecules join together in an antiparallel fashion. Next, anchoring fibrils are formed by lateral associations of antiparallel dimers. Anchoring fibrils wind around the dermal interstitial collagen fibrils and reinsert back upon the lamina densa, attaching the BMZ to the underlying dermis. Most cases of epidermolysis bullosa simplex are associated with mutations of the genes coding for keratins 5 and 14. The level of skin separation is at the mid basal cell associated with variable intermediate filament clumping. Most epidermolysis bullosa simplex keratin gene mutations are inherited dominantly and interfere with keratin filament assembly. A smaller subset of patients with recessively inherited disease of varying severity exists. Mutations coding for the most conserved regions of keratins 5 and 14 (helix boundary domains) produce the most severe forms of epidermolysis bullosa simplex. Of the severe forms, the Dowling-Meara subtype exhibits intermediate filament clumping. Conversely, milder forms of the disease, such as the Weber-Cockayne subtype, are associated with mutations at the less conserved regions of keratin 5 and keratin 14 genes. In patients with epidermolysis bullosa simplex, the mutations that code for the amino terminus of keratin 5 are associated with mottled pigmentation. A small group of patients with recessively inherited epidermolysis bullosa simplex has been shown to have associated muscular dystrophy caused by mutations of the gene coding for HD1/plectin. Junctional epidermolysis bullosa has a highly variable molecular etiology and represents a collection of different diseases. These diseases all cause blistering in the lamina lucida and variable hemidesmosomal abnormalities. Mutations in genes coding for laminin-332 subunits (alpha-3 chain, laminin beta-3 chain, laminin gamma-2 chain), collagen XVII (BP180), a6 integrin, and b4 integrin have been demonstrated. More than half of junctional epidermolysis bullosa cases are caused by one of two recurrent nonsense mutations in the LAMB3 gene, which is helpful for mutation analysis and prenatal testing. Herlitz (letalis) junctional epidermolysis bullosa is characterized by null mutations of laminin-332 genes, resulting in a lack of laminin-332 expression in the tissues of patients. Missense mutations of laminin-332 genes that result in expression of presumably dysfunctional laminin-332 can result in a milder phenotype, such as generalized atrophic benign epidermolysis bullosa. Generalized atrophic benign epidermolysis bullosa also can be caused by mutations of the gene coding for collagen XVII (BP180). Mutations of the genes coding for beta-4 and alpha-6 integrin also have been associated with junctional epidermolysis bullosa. In this group of diseases, separation of the skin occurs at the level of the hemidesmosome region. The resultant molecular defects contribute to the clinical manifestation of pyloric atresia. Dystrophic epidermolysis bullosa thus far has been associated in all cases with mutations of the gene coding for type VII collagen (COL7A1). Anchoring fibrils are affected in patients with dystrophic epidermolysis bullosa, and the degree of involvement ranges from subtle changes to complete absence. In all patients, a sublamina lucida plane of blister cleavage is present. In some patients, defects of type VII collagen secretion are present. In the recessive forms, COL7A1 mutations usually cause premature termination codons, resulting in an absence of type VII collagen in tissue. COL7A1 mutations, which do not cause premature termination codons, usually produce less severe disease. For example, mutations that produce glycine substitutions of the triple helical region can interfere with triple helical assembly of the type VII collagen molecule. These types of mutations, which exert a dominant-negative type of effect, are present in many patients with milder dominant forms of this disease. The United States National Epidermolysis Bullosa Registry  found the overall incidence and prevalence of epidermolysis bullosa to be 19.6 and 11.07 cases per 1 million live births, respectively. The incidence and prevalence of epidermolysis bullosa simplex were found to be 7.87 and 6 cases per 1 million live births, respectively. The incidence and prevalence of junctional epidermolysis bullosa were found to be 2.68 and 0.49 cases per 1 million live births, respectively. The incidence and prevalence of dominant dystrophic epidermolysis bullosa were found to be 2.12 and 1.49 cases per 1 million live births, respectively. The incidence and prevalence of recessive dystrophic epidermolysis bullosa were found to be 3.05 and 1.35 cases per 1 million live births, respectively. According to the National Epidermolysis Bullosa Registry,  the prevalence epidermolysis bullosa cases in Norway is 54 cases per million live births, in Japan is 7.8 cases per million live births, in Italy is 15.4 cases per million live births, in Australia is 10.3 cases per million live births, and in Croatia is 9.6 cases per million live births. Onset of epidermolysis bullosa is at birth or shortly after. The exception occurs in mild cases of epidermolysis bullosa simplex, which may remain undetected until adulthood or occasionally remain undiagnosed. Epidermolysis bullosa is a lifelong disease. Some subtypes, especially the milder epidermolysis bullosa forms, improve with age. Infancy is an especially difficult time for epidermolysis bullosa patients. Generalized blistering caused by any subtype may be complicated by infection, sepsis, and death. Severe forms of epidermolysis bullosa increase the mortality risk during infancy. Patients with the generalized severe (previously termed Herlitz or letalis) form of junctional epidermolysis bullosa have the highest risk during infancy, with an estimated mortality rate of 87% during the first year of life. In patients with epidermolysis bullosa who survive childhood, the most common cause of death is metastatic squamous cell carcinoma (SCC), as in the image below. Recessively inherited dystrophic epidermolysis bullosa; squamous cell carcinoma. This skin cancer occurs specifically in patients with recessively inherited epidermolysis bullosa who most commonly are aged 15-35 years. In contrast, dominantly inherited epidermolysis bullosa simplex and dystrophic epidermolysis bullosa and milder forms of junctional epidermolysis bullosa may not affect a patient's life expectancy adversely. Education in proper nutrition and wound care is essential for the patient and family. Fine JD. Inherited epidermolysis bullosa: past, present, and future. Ann N Y Acad Sci. 2010 Apr. 1194:213-22. [Medline]. Sawamura D, Nakano H, Matsuzaki Y. Overview of epidermolysis bullosa. J Dermatol. 2010 Mar. 37(3):214-9. [Medline]. Fine JD, Eady RA, Bauer EA, et al. The classification of inherited epidermolysis bullosa (EB): Report of the Third International Consensus Meeting on Diagnosis and Classification of EB. J Am Acad Dermatol. 2008 Jun. 58(6):931-50. [Medline]. McGrath JA, Mellerio JE. 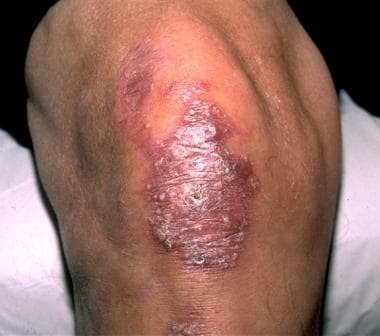 Epidermolysis bullosa. Br J Hosp Med (Lond). 2006 Apr. 67(4):188-91. [Medline]. Ersoy-Evans S, Erkin G, Fassihi H, et al. Ectodermal dysplasia-skin fragility syndrome resulting from a new homozygous mutation, 888delC, in the desmosomal protein plakophilin 1. J Am Acad Dermatol. 2006 Jul. 55(1):157-61. [Medline]. Lai-Cheong JE, Tanaka A, Hawche G, Emanuel P, Maari C, Taskesen M, et al. Kindler syndrome: a focal adhesion genodermatosis. Br J Dermatol. 2009 Feb. 160 (2):233-42. [Medline]. Has C, Wessagowit V, Pascucci M, Baer C, Didona B, Wilhelm C, et al. Molecular basis of Kindler syndrome in Italy: novel and recurrent Alu/Alu recombination, splice site, nonsense, and frameshift mutations in the KIND1 gene. J Invest Dermatol. 2006 Aug. 126 (8):1776-83. [Medline]. Lanschuetzer CM, Muss WH, Emberger M, Pohla-Gubo G, Klausegger A, Bauer JW, et al. Gene symbol: Kind1. Disease: kindler syndrome. Hum Genet. 2004 Jul. 115 (2):175. [Medline]. Ashton GH. Kindler syndrome. Clin Exp Dermatol. 2004 Mar. 29 (2):116-21. [Medline]. Fine JD. Epidemiology of Inherited Epidermolysis Bullosa Based on Incidence and Prevalence Estimates From the National Epidermolysis Bullosa Registry. JAMA Dermatol. 2016 Jul 27. [Medline]. Fine JD, Bauer EA, McGuire J, Moshell A, eds. Epidermolysis Bullosa: Clinical, Epidemiologic, and Laboratory Advances and the Findings of the National Epidermolysis Bullosa Registry. Baltimore, Md: Johns Hopkins University Press; 1999. Risser J, Lewis K, Weinstock MA. Mortality of bullous skin disorders from 1979 through 2002 in the United States. Arch Dermatol. 2009 Sep. 145(9):1005-8. [Medline]. Kiritsi D, Garcia M, Brander R, Has C, Meijer R, Jose Escámez M, et al. Mechanisms of natural gene therapy in dystrophic epidermolysis bullosa. J Invest Dermatol. 2014 Aug. 134 (8):2097-104. [Medline]. Fassihi H, Eady RA, Mellerio JE, et al. Prenatal diagnosis for severe inherited skin disorders: 25 years' experience. Br J Dermatol. 2006 Jan. 154(1):106-13. [Medline]. Heagerty AH, Eady RA, Kennedy AR, et al. Rapid prenatal diagnosis of epidermolysis bullosa letalis using GB3 monoclonal antibody. Br J Dermatol. 1987 Sep. 117(3):271-5. [Medline]. Marinkovich MP, Meneguzzi G, Burgeson RE, et al. Prenatal diagnosis of Herlitz junctional epidermolysis bullosa by amniocentesis. Prenat Diagn. 1995 Nov. 15(11):1027-34. [Medline]. Tong L, Hodgkins PR, Denyer J, et al. The eye in epidermolysis bullosa. Br J Ophthalmol. 1999 Mar. 83(3):323-6. [Medline]. Bauer EA, Herron GS, Marinkovich MP, Khavari PA, Lane AT. Gene therapy for a lethal genetic blistering disease: a status report. Trans Am Clin Climatol Assoc. 1999. 110:86-92. [Medline]. Pulkkinen L, Uitto J. Mutation analysis and molecular genetics of epidermolysis bullosa. Matrix Biol. 1999 Feb. 18(1):29-42. [Medline]. Vailly J, Gagnoux-Palacios L, Dell'Ambra E, et al. Corrective gene transfer of keratinocytes from patients with junctional epidermolysis bullosa restores assembly of hemidesmosomes in reconstructed epithelia. Gene Ther. 1998 Oct. 5(10):1322-32. [Medline]. Mavilio F, Pellegrini G, Ferrari S, et al. Correction of junctional epidermolysis bullosa by transplantation of genetically modified epidermal stem cells. Nat Med. 2006 Dec. 12(12):1397-402. [Medline]. Woodley DT, Keene DR, Atha T, Huang Y, Lipman K, Li W, et al. Injection of recombinant human type VII collagen restores collagen function in dystrophic epidermolysis bullosa. Nat Med. 2004 Jul. 10(7):693-5. [Medline]. Woodley DT, Keene DR, Atha T, et al. Intradermal injection of lentiviral vectors corrects regenerated human dystrophic epidermolysis bullosa skin tissue in vivo. Mol Ther. 2004 Aug. 10(2):318-26. [Medline]. Petrof G, Martinez-Queipo M, Mellerio JE, Kemp P, McGrath JA. Fibroblast cell therapy enhances initial healing in recessive dystrophic epidermolysis bullosa wounds: results of a randomized, vehicle-controlled trial. Br J Dermatol. 2013 Nov. 169 (5):1025-33. [Medline]. Venugopal SS, Yan W, Frew JW, Cohn HI, Rhodes LM, Tran K, et al. A phase II randomized vehicle-controlled trial of intradermal allogeneic fibroblasts for recessive dystrophic epidermolysis bullosa. J Am Acad Dermatol. 2013 Dec. 69 (6):898-908.e7. [Medline]. Siprashvili Z, Nguyen NT, Gorell ES, Loutit K, Khuu P, Furukawa LK, et al. Safety and Wound Outcomes Following Genetically Corrected Autologous Epidermal Grafts in Patients With Recessive Dystrophic Epidermolysis Bullosa. JAMA. 2016 Nov 1. 316 (17):1808-1817. [Medline]. Terrill PJ, Mayou BJ, Pemberton J. Experience in the surgical management of the hand in dystrophic epidermolysis bullosa. Br J Plast Surg. 1992 Aug-Sep. 45(6):435-42. [Medline]. Ames WA, Mayou BJ, Williams KN. Anaesthetic management of epidermolysis bullosa. Br J Anaesth. 1999 May. 82(5):746-51. [Medline]. Falabella AF, Valencia IC, Eaglstein WH, Schachner LA. Tissue-engineered skin (Apligraf) in the healing of patients with epidermolysis bullosa wounds. Arch Dermatol. 2000 Oct. 136(10):1225-30. [Medline]. Marinkovich MP. Update on inherited bullous dermatoses. Dermatol Clin. 1999 Jul. 17(3):473-85, vii. [Medline]. Marinkovich MP, Herron GS, Khavari PA, Bauer EA. Inheritied Epidermolysis Bullosa. Freedberg IM, Eisen AZ, Wolff K, Austen KF, Goldsmith LA, Katz SI, Fitzpatrick TB, eds. Fitzpatrick's Dermatology in General Medicine. 6th ed. New York, NY: McGraw-Hill; 2003. 596-609. Marinkovich MP, Verrando P, Keene DR, et al. Basement membrane proteins kalinin and nicein are structurally and immunologically identical. Lab Invest. 1993 Sep. 69(3):295-9. [Medline]. McAllister JC, Peter Marinkovich M. Advances in inherited epidermolysis bullosa. Adv Dermatol. 2005. 21:303-34. [Medline]. Meneguzzi G, Marinkovich MP, Aberdam D, Pisani A, Burgeson R, Ortonne JP. Kalinin is abnormally expressed in epithelial basement membranes of Herlitz's junctional epidermolysis bullosa patients. Exp Dermatol. 1992 Dec. 1(5):221-9. [Medline]. Olivry T, Dunston SM, Marinkovich MP. Reduced anchoring fibril formation and collagen VII immunoreactivity in feline dystrophic epidermolysis bullosa. Vet Pathol. 1999 Nov. 36(6):616-8. [Medline]. Ortiz-Urda S, Lin Q, Green CL, Keene DR, Marinkovich MP, Khavari PA. Injection of genetically engineered fibroblasts corrects regenerated human epidermolysis bullosa skin tissue. J Clin Invest. 2003 Jan. 111(2):251-5. [Medline]. Seitz CS, Giudice GJ, Balding SD, Marinkovich MP, Khavari PA. BP180 gene delivery in junctional epidermolysis bullosa. Gene Ther. 1999 Jan. 6(1):42-7. [Medline]. Epidermolysis bullosa simplex localized (formerly termed Weber-Cockayne subtype). This mild bullous disease is characterized by localized blistering at sites of trauma such as the feet. Epidermolysis bullosa simplex, generalized (formerly termed Koebner subtype). Palmoplantar blistering and hyperkeratosis are noted. Epidermolysis bullosa simplex, generalized (formerly termed Koebner subtype). Close-up image shows hyperkeratotic papules and plaques on the palm. Junctional epidermolysis bullosa, generalized severe (formerly termed Herlitz or letalis) subtype. This severe disease is characterized by generalized intralamina lucida blistering at birth, significant internal involvement, and a poor prognosis. Recessively inherited dystrophic epidermolysis bullosa pseudosyndactyly (mitten-hand deformity) of the hands and feet. Recessively inherited dystrophic epidermolysis bullosa; oral cavity blistering and scarring. Diagram illustrating the organization of the dermal epidermal basement membrane and level of disruption in epidermolysis bullosa subtypes. EBS: epidermolysis bullosa simplex. 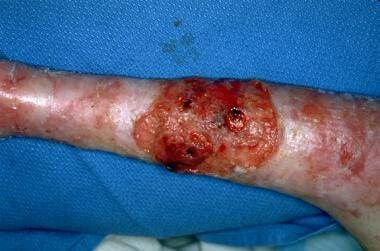 JEB: junctional epidermolysis bullosa. DEB: dystrophic epidermolysis bullosa. The authors and editors of Medscape Reference gratefully acknowledge the contributions of previous author, Ngoc Pham, MD, to the development and writing of this article.